The K-2000 rotary harrow from K-Line Industries is a versatile model ideal for a wide range of working methods, conditions and soil types. 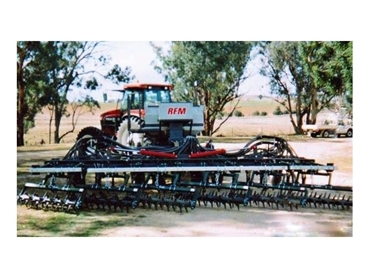 Stubble management, trash handling and weed control can all be managed through rotary action and with the unique positioning of the tines on each harrow, levelling and conditioning of the soil will be improved. The K-Line also comes equipped with an adjustable depth control which is of use when sowing small seeds. The angle of aggression is adjustable from 28 degrees to 42 degrees. Easily fitted the K-2000 is ideal for fitting to the 2500 series universal bar which is used for stubble management and small seed establishment.